Making dinner again – It’s been a long week, but I’m feeling mostly human again after battling my monster headcold, especially after I figured out that taking I coud bury the vulgar tasting steroid pills that I got to knock it out in some yogurt. The first two doses that I took before I got smart were almost as bad as the sickness itself. I can tell that I’m getting back to normal since tonight was the second night in a row that I’ve made a real honest-to-goodness homemade dinner. While I was just scraping by, I was coming up with some pretty interesting concoctions. But, tonight, I made some miso chicken. Perhaps the most exciting aspect of that little adventure was that I got to use my tahini and anchovy pastes one last time before I had to throw them out due to expiration dates. I swear Cooking Light must have the corner on the eclectic grocery items market; I wind up with the strangest ingredients when I pull my recipes from their website or magazine. I know I’ve skipped Toning Up Thursdays for 3 weeks now. ::Gasp:: The water and exercise goals have been abysmal though I was downing hot tea like a fiend for awhile. And, I’m happy to report that I’m still losing. Yay! Yep, I took the plunge; I hope I’m not totally freaking out in mid-December about making the blocks; they are due mid- January, but I’m nervous because this will be the first time people are counting on me to get blocks finished for them. I’ll have 5 blocks to make. Better get militant about my 1/4 seams. But, I figure it’s a scrappy quilt, so that should make color selection easier, right? Right? Please, someone tell me I can do this 🙂 I suggested yellows and grays with some touches of aqua and teal for the blocks that I’ll get. I know, it’s not the most innovative color scheme on the block, but I love grays and yellows, so it will be hard for my beemates to go wrong. I’m joining in on round 3, so I might have to make a number of blocks on my own for my quilt to get a full top, but hey, this will get me started. Any experienced bee participants out there can feel free to throw some participation tips my way. Rodeo Tickets Arrived This week, I got quite possibly the most exciting overnight mail envelope I’ve ever received. Ever. It had my sister and I’s rodeo tickets for December. There are even glossy cowboy pictures on them. The gatekeepers better rip off my ticket stub super carefully so they don’t mess up the rest of my pretty rodeo ticket. I’m hoping for one more piece of exciting email news to come through before the end of the weekend, but I’ll keep that under wraps for now. If the details work together, then I’m giving myself one amazing birthday present this upcoming year. 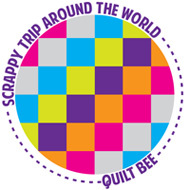 This entry was posted in that's life and tagged quilting bee. Bookmark the permalink. Hey! Your going to do great at the bee, and I love your colour choices! I think it’s going to look great!! I’m intrigued can’t wait to find out what you’ve given yourself for your birthday!! Only advice is don’t wait till the last minute to get your blocks done!